﻿ Royal Oberoi Resort Hotel, Palawan | FROM $44 - SAVE ON AGODA! "Very good room and swimming pool." Have a question for Royal Oberoi Resort Hotel? "The pool is large and has a great swim up bar." "It is very secluded and peaceful yet only a 15 minute drive from the airport." "It has a lovely huge pool with poolside bar and a restaurant serving good food." "The staff are great and friendly." Royal Oberoi Resort Hotel is a small boutique hotel set in its beautiful grounds outside of Puerto Princesa's city center. Conveniently located just away from the main hustle and bustle of the city center, but within easy reach of the city’s nightlife, cultural, shopping, and restaurant areas, the resort provides a beautiful getaway location for you to take a break from your busy days. The city center is merely five kilometers away, and the airport can be reached within 20 minutes. Royal Oberoi Resort Hotel features 15 beautifully appointed guestrooms. All rooms are non-smoking but with seating just outside for smokers. Each room includes a television, air conditioning and a ceiling fan, hot and cold showers, coffee/tea making facilities, and a mini-bar. Throughout the day, you can relax poolside at the pool bar, lay out on the loungers or cabanas around the beautifully landscaped gardens, or for the more adventurous, take a lesson from the diving school. Royal Oberoi Resort Hotel offers superb facilities including a highly acclaimed restaurant. "overall we enjoyed our stay"
This place is GREAT !! At first you may not be too sure (as it is down a narrow and bumpy road), but once you are inside the grounds of the Hotel you will feel like you are in another world. 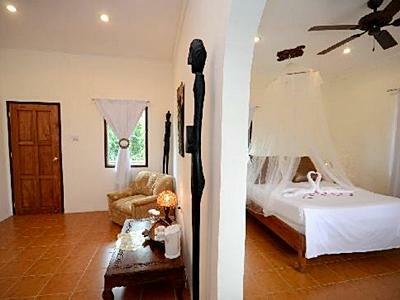 We stayed in the Villa because the increase in price was small when compared with double the space of the deluxe room. The pool was gorgeous. The shallow end is 5 feet, so good to know how swim (or be a tall person). The food is very good, the portions generous. The desserts are sublime, extremely well prepared and quite delicious. Be sure to try the Banana Fritter and the Mango Crepe desserts. Mmmm... And only 150 pesos each. You also get 8 good-sized shrimp with the Shrimp Tempura (550 pesos). The quality of all the food we ordered was way more than average. We will definitely return here again when we come to Palawan for another visit. 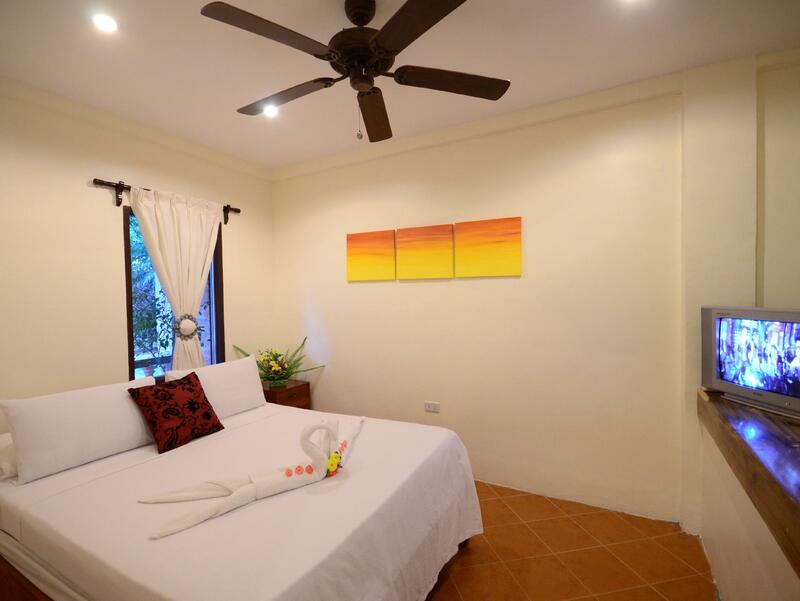 It is located not far from the airport, but be sure to ask for the airport transfer for 200 pesos when booking. The Airbus A-320 disgorges a lot of passengers all at once, so it's good to have your transport to (and from) the hotel pre-arranged. All the staff were more than helpful. If you don't have a talk and text phone, good to have this. Everybody texts everybody, so buy yourself a Philippines phone if you do not have one already. You can buy a decent one for around 1k or less. You'll need to hire a tricycle to get around Puerto Princesa and where you want to go locally. A laundry place to have your clothes washed is not far, and on the way into town. Enjoy !! We asked for an airport pick up and the driver was waiting for us outside the airport. The reception staff were quick to check in, about 5 minutes for all the formalities. Restaurant had a good choice on the menu but close early by 10 pm, we would have preferred them to open at least till 11 pm. Complementary Breakfast was a set menu with 3 types-Continental with Ham, choice of egg, toast & preserves; local which comprises of choice of egg, sausage and fried rice with beverages; the 3rd type is just a fruit platter. The spa was fantastic with professional staff called from outside for a pampering experience. Make sure to book your slots in advance. The only thing we disliked was small sized bathrooms and fitting. W/C and basin was baby size! Also only a small instant heater for hot water. You need to run the tap on a slow trickle to get hot water! If you need to go to city, just inform the gate security and they will call in a tricycle( a motorcycle with side passenger seats), costs about 100 pesos for one way to city which is like 15 minutes ride. House keeping staff provided superb service and room cleaning. Hair dryer,face towels,jug of drinking water are not provided but are provided on request within 2 minutes. Overall a pleasant experience. Gardens, nice pool, quiet surroundings. The hotel was excellent value for money, the food we had was very good, the staff were very helpful and attentive, the bed was comfortable. The gardens were very nice. There were a few things that could be improved, such as the fridge was a little noisy and the water appeared to be switched off over night. However for the money this is a great value hotel. The pool is large and has a great swim up bar. It is quite far from anywhere, so you do need to get a trike if you are going out. The grounds are nice, with lots of greenery, and the breakfast restaurant is really lovely. The staff were helpful with making phone calls and welcomed us kindly. The rooms are basic, but comfortable. I would have liked a larger bathroom. The price is about reasonable, although their tours are a bit more expensive than if you book your own. They should put free water in the room, rather than making you pay for it. The food in the restaurant is lovely, but can take a long time to arrive, so make sure you plan that into your timing. We enjoyed our time here and would come back. It is the high season in Palawan and not many places are still available. So I was very worry when the Oberoi looked empty. What a nice surprise when arriving the place... It is somewhat far and not in the center, it is somewhat old and been renovated maybe not to the most high expectation but it is great place. First the friendly people - starting from airport pick-up, reception, handle of tour booking and private van, great swim-pool that make you wish to stay all day in there. Breakfast is small as they have very few rooms so can not have buffet. Wifi is need great improvement!!!! It is not strong enough in the rooms. I stayed at the Royal Oberoi hotel at both the beginning and the end of my trip to Palawan. The hotel is out of the main town of Puerto Princessa and is just off the main road. It is very secluded and peaceful yet only a 15 minute drive from the airport. It has a lovely huge pool with poolside bar and a restaurant serving good food. Complimentary breakfast was included.. The room was spacious with one of the most comfortable beds I have ever slept on in any hotel I have been to. Special mention must go to Lanni on reception who was super helpful and simply could not do enough to make my stay as stress free as possible. Thank you Lanni for all your help. I would definitely stay at the Royal Oberoi Hotel again and would not hesitate in recommending it. The TV was not working nor the telephone and WiFi is only working inbtge reception area. The breakfast was very small and disappointing. Pool area is quite nice and it's a pretty nice place but even close to be value for money. Our stay at the Royal Oberoi was excellent. The room was nice and clean, and the staff was excellent. The food was good, and there was a pretty decent selection. The front desk staff helped us book our tours to the Underground River and El Nido, and they didn't mark it up a ton. Actually, I don't even know if they marked it up at all. The gorgeous garden, humongous swimming pool, and the animals ( 2 white cats, puppy, roosters, and fish) add to the ambiance. The older masseuse from our couples massage answered her phone and texted a lot during the massage, and she didn't ask how the if there was enough or too much pressure on the massage. However the younger masseuse (who spoke English) was amazing during the scrub, massage, and mani-pedi. Even though the wifi didn't work, it was probably for the best; I spent less time on my phone and more time reading my books and admiring the beautiful hotel grounds. We absolutely will be back again! We stayed there with a 7-month baby in a Villa for 10 nights. It was very easy to sleep there as a family. We also really liked there food. We had 19 meals there so we feel we had a good grasp of what they offer -- most of them were very tasty (comparable to top 10 rated restaurants in the area which we tried two), and usually bigger in portion and probably 70% of the price. The garden is so beautiful to relax in with the baby and simply walk around. The booking I made is a suite villa room for 6 person, and they ask me to paid for additional of 650 per person per night because they said that my booking is for maximum of 2 person. I just feel like been cheated, we are 6 persons that's why we booked a suite villa for 6, my point is if we are two person we don't have to booked for suite villa, right? for there is price difference??? So We stayed for two nights, and that is ADDITIONAL worth of 5,200 and I think that is very overpriced, which is I can stay to a much better hotel in that price. We loved it. We had our own little house which was great for the family. Huge very clean pool 30m pool was sensational though the shallow end would be too deep for very small children. We loved that lots of people use the pool and they actually had a bar that provided food and drink while at the pool. All staff very professional, the food was excellent and was one of the few places where during our long trip where we actually enjoyed eating at the hotel. Only thing to know is they are a short tricycle ride from town, but even that was part of the fun. My husband and I stayed at the Royal Oberoi for 4 nights and we were glad we chose this hotel. It is about 20 minutes from the town centre, located in a nice quiet spot away from the main road. The hotel grounds are well maintained and the outdoor swimming pool was enormous, deep and very clean with a pool bar. We stayed in Room No. 20 on the ground floor and the room was very spacious and had a living room area attached to the bedroom. Breakfast was only a choice of two and got a bit boring after the second day. No buffet. The pool bar shut at 9:30 pm and maybe this is because it is low season. The internet in the room did not work when we first checked in. After complaining to the receptionist, the girl fixed the problem and we had good strong wifi in the room. As our flight back to Manila was late in the evening, we requested if we could have a late check out. The receptionist told us that we would have to pay 200 pesos per hour. Check out time was 12 noon and they did not give any grace, and so we had to spend the entire afternoon at the Robinson shopping centre. The food was average and most times, they did not have the dishes we wanted to order. It was quite limited for the drinks at the bar as well. The hotel has a Spa and it was nice to have a massage (700 pesos per hour without having to go anywhere else. If you are looking for excitement and shopping, this is not the place for you. We liked it as we just wanted to stay in a quiet place to relax. Overall, we had an enjoyable stay and will stay there again if we go back to Palawan. had the best pool in Palawan, very nice and kept clean. The locationn was great because it was quiet at night. The staff was marvelous. Had a great stay and would go back again. The hotel is a little far from Puerto Pricessa but it was very easy to get a trike to take us into town and back. The pool is great and very clean. The staff was marvelous and they provide 24hr security at the front gate. Can recommend this resort to all travellers. Without a doubt the most conscious of what an international traveler is expecting.. From the arrival to departure they anticipated all of our needs.. Umbrellas, breakfast anytime anywhere, all the details are not your concern because they are well thought out.. If you want an oasis in Puerto Princesa where you can relax and really just not worry this is the place. Management makes a point of letting you know your value even when the hotel is fully booked. Stay here.. period..
Actually the location wasn't bad. Not so far from the airport, not so far for any tour : underground river, city tour, islands hopping, and also not so far from good pubs and bar. It would take you with tricycle not more than 15 min and for the tour, you will get pick up the last and send back the first so can sleep more in the morning. Room was spacious but otherwise just average,water heater barely working and air-con a bit noisy. George did a great job making up the room every day though! The pool and pool-bar was fantastic, and had a nice party atmosphere to it at night with the music and illuminations. The gardens were also very nice and well kept. We had dinner at the restaurant a couple of times, didn't try the pizzas but the seafood was outstanding, especially the blue marlin and the crab salad. When I say the seafood at Oberoi was better than at Badjao and KaLui I'm not exaggerating, second only to Pandan Island! 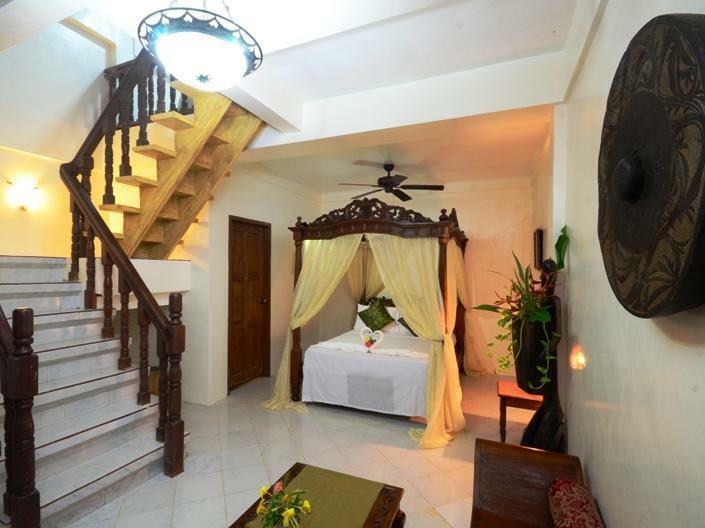 The hotel also has a spa where we had a very good thai massage, although a bit expensive at 700 pesos (can be had in downtown Puerto Princesa for 250-450 pesos). Finally the staff were super friendly and helpful, especially Bong at the front desk, George who made up our room, and Dan the waiter who helped us arrange tricycle trips. Overall the hotel was very good and good value for money, and we would definitely stay there again if we came back to Puerto Princesa. free wifi, an awesome pool, nice garden. room condition is very good. I stay standard room it has enough space. but drain is not good. hotel location is not comfortable because it is far from downtown. but if you want calm and beautiful place, this hotel is very good.